Sellers today are more distracted than ever. Never ending emails, phone calls, texts, social media messages, and more that interrupt workflow every few minutes are killing focus and productivity. More importantly, they're killing your sales results. In this webinar, Mike Schultz, President of RAIN Group, Director of the RAIN Group Center for Sales Research, and bestselling author of Insight Selling, shares 9 habits of extremely productive people and how you can apply these habits to achieve the greatest sales success starting now. Whether you're a seller or sales leader, these habits are essential to improving sales results. You'll leave with productivity hacks you can apply immediately to your daily routine that are guaranteed to make you more productive. 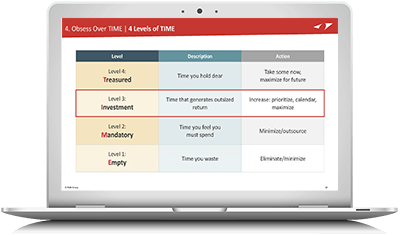 Plus you'll get access to our ebook, The 9 Habits of Extreme Productivity, and the chance to take our proprietary XP Assessment. If you want to boost your motivation, get more done, and achieve the greatest success, this webinar is a must-watch.